The inhabitants of Aurore always took a special pride in their home - it was the most spectacularly beautiful and at the same time least hospitable of the garden planets in the French Arm. For years it was also the end of the line in a colonial arm that terminated at planetless Arcturus, a dull ruby in Aurore's night sky. The Kafers were first encountered at Arcturus, and then their invasion fleet and invading armies struck Aurore. The battle was close, but the major population centers held out. Now, the remaining Kafers need to be hunted down and rooted out. Kafer Dawn covers the campaign to mop up the Auroran "hotback" from the viewpoint of several adventurers who come to join the fight against mankind's most bitter foe. Despite over a year of warfare, little is known of the Kafers, and so Kafer Dawn is a voyage of discovery as well. Are the Kafers necessarily our implacable enemies, or can better understanding bring peace to both species? 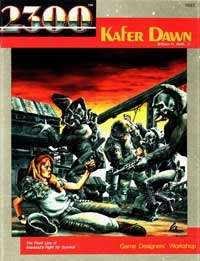 Kafer Dawn gradually introduces the players to Kafers over the course of four new separate adventures (all included in this booklet) which form a mini-campaign. From the time the players ground ship on Aurore as raw recruits to the time they participate in the final drive against the last major groupings of Kafers in the hotback, they will gradually learn more and more about their violent ut complex enemy. This title was added to our catalog on May 07, 2004.